New Mexico Greyhound Bus Crash: Multiple deaths, serious injuries. 49 were on board. Multiple deaths and many people with serious injuries are reported in a Greyhound bus crash on a freeway in New Mexico, police say. The bus and semi-truck crashed into each other on Interstate 40 in Thoreau, N.M., Aug. 30, 2018. Greyhound says 49 people were on board the bus. "There are multiple serious injuries and passengers transported. Officers and EMS are actively working and assessing the scene, said New Mexico State Police. More than 33 patients have been transported to local area hospitals with injuries, some are said to be in critical condition, officials said. NTSB is launching a go-team to investigate today's crash involving a Greyhound bus and a truck-tractor semitrailer on Interstate 40 in Gonzales, New Mexico. A bus and semi-truck crashed into each other on Interstate 40 in Thoreau, N.M., Aug. 30, 2018. 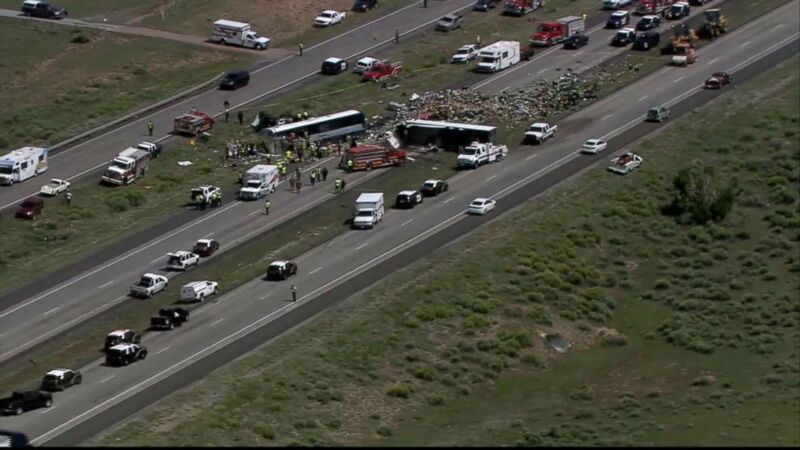 BREAKING: New Mexico authorities report multiple fatalities in commercial bus crash. Greyhound officials now say there were 49 passengers on board.